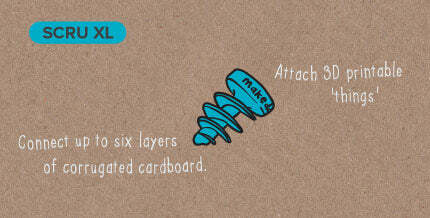 Makedo is custom designed to make cardboard construction easy for everyone. The perfect material for creative construction. Cardboard is everywhere! It’s in your recycling bin, protecting your fruit and veg from farm to table and helping you move house. Why, it probably found itself wrapped around your last birthday gift! Happy birthday, in case we missed it. Cardboard has some incredible qualities that make it pretty much perfect for making stuff. In fact, no other material is as strong that can also be easily manipulated by the hand of a child. It folds (which makes it even stronger) and cuts and swivels and is seriously durable. Of course when combined with adrenaline-fuelled excitement it could get knocked to bits, but then you just need to recycle what you have used and readily find more. Simple as that. Upgrade your skills with these 15-second tutorials and become a Master Maker in no time. Print freely available 3D parts to extend the capabilities of Makedo well into the future. Get some truly kinetic action with this free swinging hinge. Doors, windows, trapdoors, drawbridges... they all hinge on you having this thing. Uses 2-3 Scrus. 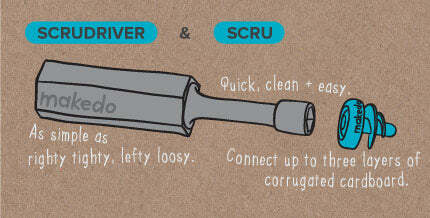 Combines features from our Scrudriver and Safe Saw into one super useful little tool. 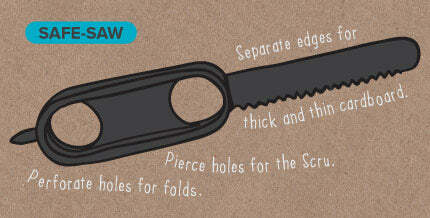 Slip it on your finger and go pro with your Makedo making skills. Secure cardboard at fixed angles from 90 to 270 degrees. Each bracket to be used in conjunction with 2x Makedo Scrus. For large scale builds, print this bit to enable use with an electric screwdriver.